Full time CHSS faculty member Jessica Mills, believes community colleges are a real service to the public because the quality of education is on par with more expensive forms of education. Jessica Mills consulting with one of her students her analytical writing class at CNM’s Main campus . Professor Mills started at CNM in 2009 while the college was experiencing a influx of students with record-breaking enrollment of 30,000 and the trend during an economic downturn is for people to go back to school to retool their skill sets, she said. “It is a dream for me, I feel like I am giving back to my community with my teaching skills and with my writing skills. I like to be inclusive, I want to teach in a very inclusive environment and I feel like a community college is that and so that is why I am here doing what I am doing” Mills said. “I thank my students for coming to CNM.” Mills said. Students are very engaged, more engaged than my generation, Mills said. Students contribute to the classroom from the benefits of life experience and the ability to be tech savvy, she said. “A couple years ago a student took a picture of the board I asked them why, confused why they would take a picture of me, he explained he only wanted a picture of the notes on the board. Now, at the end of class I take a picture of what I have explained because it’s this great visual record,” Mills said. Previously a teacher who formally disallowed any phone use in the classroom, she has realized how smartphones can be an educational tool and not just an addictive distraction in the classroom, she said. Another benefit of CNM is that it has incredible resources that may go under-utilized by some students for a variety of reasons, she said. There is the ACE tutoring center with professional tutors, the computer labs, Academic Coaches, the Disability Resource Center, the Veterans Resource Center and a food pantry where students can get food, she said. There is an early alert system teachers have access to which is like sending a life preserver to a student by giving them help from academic coaches if they are struggling, she said. “My advice for students would be, get out of your comfort zone and seek the available resources that CNM has to offer you to help you succeed and reach your goals,” Mills said. With degrees in English, Education, and a Master’s degree in English Education, Professor Mills taught in a Florida high school and at University of Florida but there were some things she wasn’t completely satisfied with, she said. After college Mills made her living playing music in bands throughout the 90s touring nationally and overseas, playing the saxophone. Becoming a parent led her to needing a different form of income, that is when she returned to teaching, she said. As a full-time instructor here at CNM with two children, she still very much enjoys playing the sax bass and drums with local bands, as well as playing with national touring bands at times, including two different tours last year, she said. “In the past I have enjoyed publishing my own Zine which has been really community building for me,” Mills said. Participant of the annual Albuquerque Zine Fest, Mills spoke about her appreciation of the DIY do-it-yourself ethos around zines and the opportunity they create to have control of your own publishing instead of waiting for a separate entity to give approval to have your words out in the world. Starting in early 2000, she wrote a monthly column titled “My Mother’s Combat Boots” for an international DIY punk zine named Maximum Rock and Roll, she said. 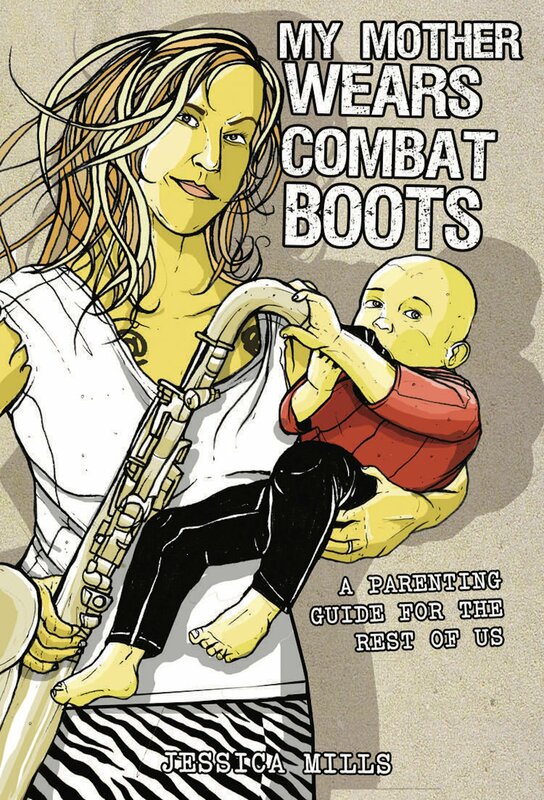 After getting feedback from a lot of fellow parents in the international punk music scene asking for the first year of columns compiled, Mills got the idea for her book mostly from her readers, she said. In 2007 her first book, “My Mother’s Combat Boots” was published, she said. “It just dawned on me after doing five years of the column, wow! I could turn this into a book and writing a book was kind of a lifelong dream,” Mills said. An interested publisher asked Mills to pitch a book idea, she did and was surprised they said yes right off the bat, she found that her new book contract terrified her, she said. “It was terrifying thinking I can’t pull this off, who am I to think I can write a book, I don’t a unique voice to add to the conversation on parenting, I knew that I did deep down but I was just scared to do it and I felt very vulnerable,” Mills said. According to her publishing contract she had a year to deliver a manuscript but for 6 months she did not write the first word, she said. The tide turned one day while living in Seattle and volunteering at Left Bank Bookstore she found herself surrounded by books written by so many different people and she thought if those thousands of totally different people can write a book then she could too, she said. “In that moment I realized it doesn’t have to be perfect and it doesn’t need to be about the book seller, I felt like okay all of these people did it, actually so can I,” Mills said. Using that year’s tax return to hire a sitter to stay with her baby, she put her older daughter on the school bus each morning and locked herself in her room and spent everyday week day on her desktop computer from January until the last day of school in May, Mills recounted. Originally thinking the book would just be a compilation of 60 different columns she had written, the book instead took on a life of its own and her original column became an outline for all new writing, she said. Then bam the book was done, completing something like 43 chapters in 6 months, she said. “I did it! It was the best effort I could have done and I’m so proud of it, I am surprised the book keeps selling but I guess even punks keep getting older and having kids so I guess it will keep selling for that crowd,” Mills said. Never intended to be a directive on how to parent, the book ended up being one third personal memoir, one third political analysis, and one third actual unsolicited parenting advice, intertwined together with informational side bars, she said. “I thought it filled a niche because it was a book I wished I had access to when I was first pregnant and becoming a brand-new parent and was completely clueless,” Mills said. “My Mother wears Combat Boots” is at the Albuquerque Public Library, there are five copies so you can check it out!,” she said.